NIIGATA MACHINE TECHNO offers Factory Automation. Share your ideas with NIIGATA. FMS is an optimal solution for manufacturing of a wide variety of products in small quantities, as well as better productivity, labor-saving and auto-operation for long period of time. 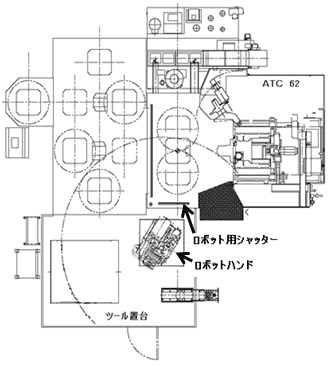 Niigata’s Machining Centers are adaptable with FMS for your efficiency. ICC (Intelligent Cell Controller) System is Niigata´s original system controller with which FMS & Robot System that Niigata offers are operated. ICC controls machining line which is combined with Machine Tools, Pallet Conveyors, Pallet Stockers and loading/unloading stations. ICC controller is based on PC and easy to be operated; machining program per pallet, machining date adjustment to the situation,etc., as well as date update and renewal of the ICC system. The components of the system are standard parts of PC manufacturer and are easy to be purchased. Accurate machine operating time can be reviewed by means of connecting PCs, which record & accumulate operation result, of each machines. Recognizing non-cutting time and/or dead time is the first step to make more efficient line operation possible. Robot arm is being replaced with operators for less wrong operation and better efficiency. Robots work with 3 sizes / 6 types of products. Operator loads a work on AGV from previous process. Robots transfer the work to each process in machining line. AGV unloads the work almost finished outside of the machining line. Robot System achieves excess moment / heavy tool exchange.